Guys will understand the pain associated with the constant niggling of a dress shirt slowly tucking itself out of your pants, and your having to endlessly readjust. 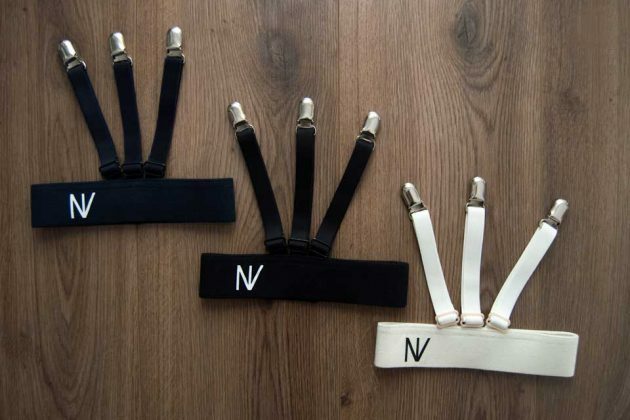 It’s not like it’s one of life’s great miseries or anything, but if a product like the NT T-Holder can make our lives even a little bit easier, I’m all for it. It’s sort of like a garter belt for guys, but instead of holding up a pair of lovely thigh highs, they hold down your shirt so it never pops back out of your pants. You’ll be able to squat, reach for items in high places, stretch, and do any of the things that would normally have been followed by a furious tucking session. It’s $35. By David Ponce on 12/30/15 • Leave a comment! Or at least, that’s the gist behind the moniker. 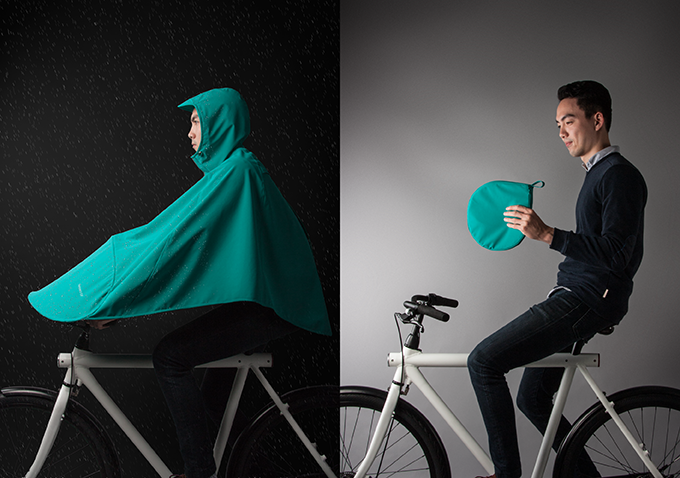 The Boncho is a waterproof, well, poncho that keeps you dry while riding your bike. 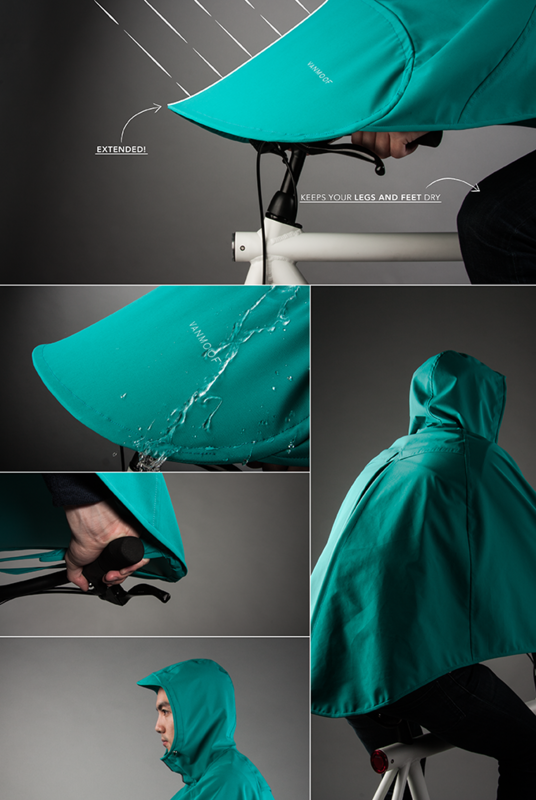 There are some like it on the market, although the Boncho does have “an additional semi-rigid section that extends over the handlebars, protecting the wearer’s legs from the rain and keeping them dry. Two fabric strips on the underside of the extended section allow the user to hold it in place while still gripping the handlebars.” It packs away nicely into its own carrying pouch, and unfurls in just a few seconds for added convenience. Sure, you’ll look a little silly wearing it, but if getting wet while on two wheels really isn’t your cup of tea, you won’t mind. At a €55 (US$60) pledge to get yours, it isn’t outrageously priced either. By David Ponce on 10/29/13 • Leave a comment! If girls can get push up bras, and bum implants, and fake eyelashes, and hair extensions, and fake nails… well it stands to reason dudes may want in on some of that sweet, sweet artificial action. 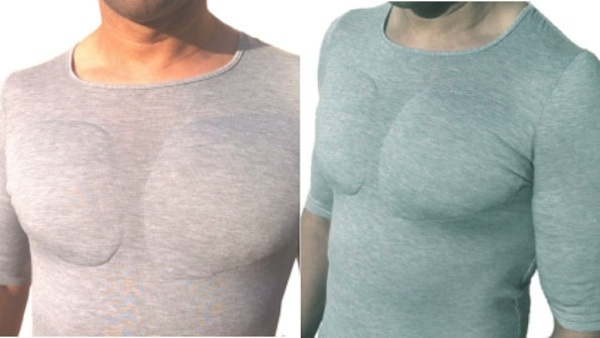 Meet the FunkyBod undershirt. Featuring a host of specially contoured and strategically placed pads, the shirt is meant to be worn under other shirts to give the impression you have more meat on your bones than you really do. There are pectoral, shoulder, bicep and triceps inserts, all of which give a balanced look and the appearance of someone who’s been lifting some iron and eating the chicken breasts like a good gym rat. Hopefully you can combine this with loose jeans so no one notices the spaghetti strands that serve as your legs, and you’re all set. After that, your plan is to go to a fairly dark nightclub and attract the attention of someone inebriated enough not to notice in the morning that you look nothing like you did on the dance floor the night before. That, my friends, is a bulletproof plan. Bulletproof. It’s £29, or roughly $46. By David Ponce on 10/15/12 • Leave a comment! It’s well known that guys take a more relaxed approach to undergarment management. We wash them… but we wear them again and again, and again, until they start disintegrating. Those old enough to remember the great philosopher Seinfeld will no doubt recall the episode where he discusses this topic. But a company over at Kickstarter is hoping to change things around, for socks anyway. 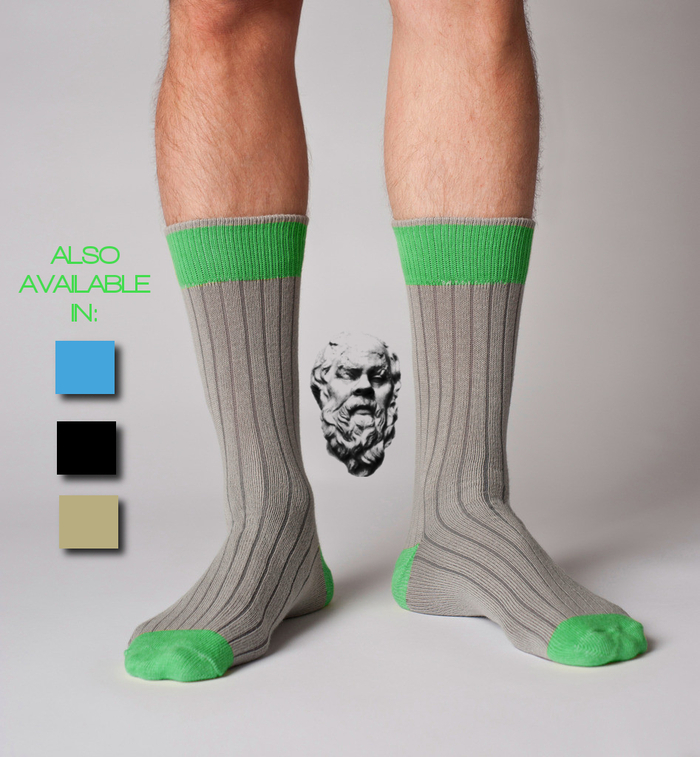 They’re calling their foot-wraps the Socrates Socks. 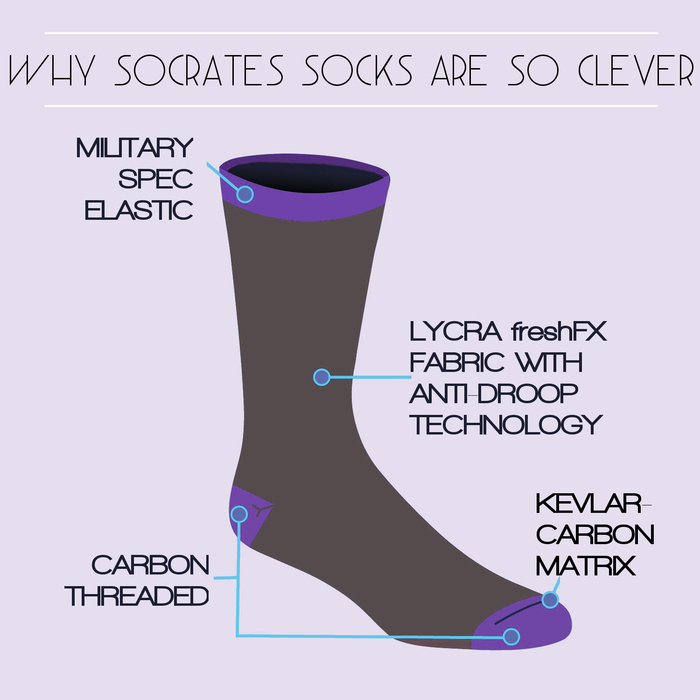 Using a military grade Kevlar|Carbon Matrix, these socks will never get a hole, droop, or wear out on the bottom. Kevlar! Carbon fiber! We don’t really know if these socks are durable or not, but that’s enough buzz words to get our attention. Kickstarter-related quality control issues aside, we feel that if the product is really up to snuff, then the ~$!5/pair asking price is relatively fair. We’d pay that much for things that, at the very least, take a little longer to fall apart.